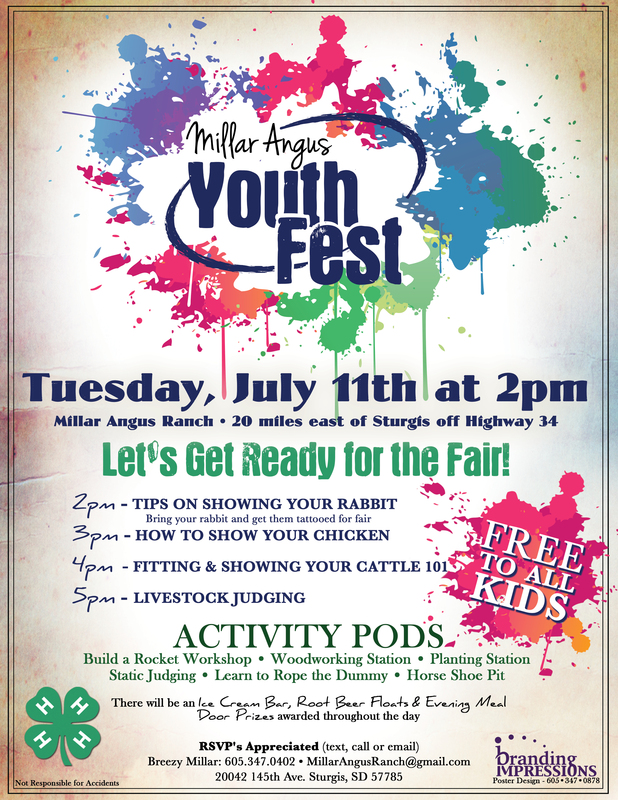 STURGIS, SD – Put a country kind of experience together with kids from all walks of life and you have the concept behind the first annual Millar Angus Youth Fest. Created by John and Breezy Millar, the July 11th event includes an interest of some kind for most all kids. "There is everything from rocket workshops to how to show your chicken," shares Millar. "We want to offer an expereince fro all kids - whether a 4-H'er or not." 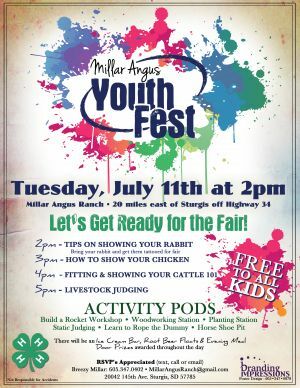 The Millar’s encourage any interested youngster to take in the Youth Fest that begins at 2:00pm on the ranch 20 miles east of Sturgis off of Highway 34. For those in 4-H, there are a number of activities geared to get kids ‘Fair ready’. "For those youngersters who are competing in area Fairs, there will be useful programs for them," says Millar. "We'll all have qualifying events for 4-Her's includiing judging events." Free to all kids, the afternoon includes what Millar calls activity pods, plus ice cream and an evening meal. "We didn't want money to be an issue," says Millar. "What we're hoping for is a fun afternoon and opportunity for kids to make new friends and learn more about activities they are interested in." Local businesses are also getting involved with the newly opened Ranatus Woodworks overseeing the woodworking station and long-time Sturgis business, Rocking Tree Floral and Landscaping, presenting the planting station. "I specifically wanted to have a variety of what I call activity pods going on throughout the afternoon," shares Millar. "Not every youngster is showing livestock at fairs or are even 4-H members. And that's okay. It's our goal to offer a fun setting on the ranch with activities, refreshments and a meal, for all kids to learn from, and enjoy and make new friends." For kids wanting to brush up on showing livestock for the upcoming Meade County Fair July 28 – 29, 2017, the schedule includes tips on showings rabbit, how to show a chicken, fitting and showing cattle 101, and livestock judging. For youngsters not in 4-H and who want to have a fun day on a working ranch, there is the build a rocket workshop, woodworking station, planting station, static judging, learn to rope the dummy, and the horse shoe pit. Organizers are asking that people rsvp for the event to help plan for supplies and refreshments.